Back in 2012 Bill McKibben and 350.org toured 20 US cities using a sustainable bus to help alert and educate the population to the terrifying math that now indicates that worldwide fossil fuel corporations have 2,795 gigatons of carbon in their reserves with every intent on selling and burning it all. That amount is just shy of 5 times more than the 565 gigatons of carbon that risks an increase of more than 2 degrees C of additional global warming! 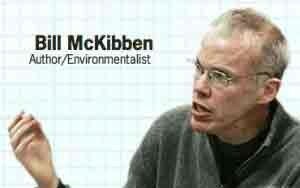 Bill McKibben was joined by a rotating cast of committed artists, actors and musicians each of which is also dedicated to spreading the message about the serious nature of global warming, climate change and the challenge of trying to stop and reverse the damage being caused by the most profitable and powerful group of corporate entities ever to exist in history–The Fossil Fuel Industry. Currently worldwide carbon emissions are about 31 gigitons of carbon a year, and that number is increasing. At the current rate, the 565-gigaton limit will be exceeded in 16 years. What can be done now to help? As individuals we can lower our own carbon footprint and take steps to actively decrease the amount of money we give to the fossil fuel companies in the form or purchases and investments. Also one can obviously support the event and efforts such as: the Do the Math Tour and 350.org. Naomi Klein, Jim Hansen, Desmond Tutu, Josh Fox and more. The “Do the Math” Movie was broadcast to millions of homes all across the US on Al Jazeera America in late 2013.